After years away, David Weaver is returning to Hollywood to bury his father. Teddy Weaver was a respected director before McCarthy's blacklist forced him to take his family and flee the country, leaving his life and career behind. David needs a job, any job, and it turns out that his father's old partner could use an assistant. The families broke ties when Leo Vardian testified against his father. In spite of his anger, David takes the job with the hope that he will be reunited with his old girlfriend - Leo's daughter Jana. The pressure of working for the man who informed on his father is only compounded by the snooping around of FBI agent Brian McKenna and the "journalism" of columnist Joe Shannon. But things go from frustrating to dangerous when informers start turning up dead and David is the prime suspect. Jerry Ludwig chose a fascinating time in history as the focus of his first novel. During the 1940s and 1950s, Senator Joe McCarthy and the House Committee on Un-American Activities accused people of sympathizing or colluding with the Russian Communists. Many of the people summoned before the committee were in the arts - actors, directors, musicians, and artists. This was, in part, because many of those working in creative industries had liberal politics. But it was also a calculated move to publicize McCarthy's efforts to eradicate communism in the US. The people called before this committee would be "forgiven" if they named other sympathizers, real or imaginary. Those who refused lost their jobs and were "blacklisted," and would never find work or respect again. Aside from being fascinating, this time in history is deeply personal to Mr. Ludwig. In the afterword, he details how people he knew were touched by McCarthy's witch hunt. Unfortunately, this very sad and interesting period and setting aren't enough to save this story. Our tale revolves around three characters - David, his girlfriend Jana, and Brian, the FBI agent who pressured David's father and is now investigating him. We get chapters from each of their points of view, all in the first person. Unfortunately, I never really believed any of them. They felt like caricatures with a few defining qualities instead of reasoning behind their decisions and characters that evolved with the story. David was angry, and we hear every other chapter or so how he is fighting to keep his anger in check. Jana is devoted to her father and David and we get that in spades. FBI man Brian is misunderstood and we read often about how he is actually a good guy who everyone thinks is bad. However, it is great fun to peer around the back lots and glamorous offices of Hollywood and the mystery itself is a fascinating one. Individuals who gave up others to the House of Un-American Activities are found murdered and all signs point to revenge. David quickly becomes a suspect, especially when Agent McKenna discovers that he was drunk on a night in question and can't remember where he was or what he did. As the murderer escalates, the tension builds and the conclusion is perfect for this tale of drama and secrets. 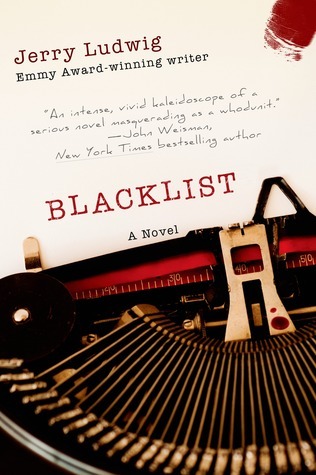 Blacklist is a taut mystery threaded through a shameful time in American history. Mr. Ludwig's commitment to giving voice to the people silenced by McCarthy is admirable and evident throughout the story. While the setting sparkles with possibility, the flat characters keep this story from becoming a star. Man that sounded really interesting and exciting until it didn't! There aren't too many books that I'm aware of set in this period of time but I imagine there's a lot of potential for stories in it. Too bad that this one doesn't seem to have hit it on the head for you. Yes, I was really intrigued by the topic! I just didn't love it the way I was hoping I would. Well, they can't all be home runs, but if they were, then how could we compare the ones we really liked! Thanks for the review; I value your opinion. I'm sorry this one fell flat! As you said, it's such an interesting time period, one that I'd love to read more about. I'm trying to think of other books revolving around the McCarthy blacklist and I'm coming up with a blank! Do you know of any?